Though the new X4's have the IPX7 rating that these are missing, the Jaybird X3's were still the 'buds to beat for roughly two years and are still a pretty solid pair of workout headphones. This post was updated on October 3rd, 2018 to include comparison to the Jaybird X4, new links to relevant information, pricing, and scoring. When you think or workout earbuds, you probably think of Jaybird. The company has numerous iteration of their X line of earbuds, starting with the Bluebuds X all the way up to the new Jaybird X4 earbuds. Although the Jaybird X4 earbuds were just released this year, the X3’s were the headphones to beat for the better part of two years. Sure, the newer X4’s fixed a few of our biggest complaints (we’ll get more into that later), but the X3’s are still a serious contender for which workout earbuds you should buy if you can find them on sale. The Jaybird X3 packaging comes with multiple sets of ear tips and even a carrying case. Opening the box you’ll get the headphones, a handy snapping carrying case with the Jaybird logo on it, a small bag with the wing tips, another small bag with silicone ear tips, and finally one with the memory foam ones. Along with that are small clips to keep the wires under control if you need them (I didn’t really), a Jaybird sticker, the charging cradle, a quick start guide, and an instruction booklet. The X3’s got a new makeover when compared to the previous X2 model, and it looks great. The cheap plastic of the X2’s is replaced with more cheap plastic, but this one just looks and feels way better. Especially in the black and silver option that we checked out. The earbuds are definitely slimmer this time around, but they’re still fairly bulky. Especially after adding the new wings and ear tips. On the bright side, I had no problem keeping these in my ears whether I was sitting at a desk or actually going for a run. A nice improvement from the Freedoms that came out earlier this year. The Jaybird X3 earbuds are a sleeker version of their predecessors. The earbuds are also slightly angled now which, when combined with the slimmer housing overall, helps these shoot audio straight down into your ear. We’ll get to the actual sound quality a little later in the review, but as far as fit goes these are a winner. The cable is more or less the same for better or worse, but the next biggest change you’ll find is with the control module/mic. It’s still located about two inches below the earbud, but the module on the X3 is now just a little bit bigger thanks to it also now housing the battery. That said, it isn’t too bulky or cumbersome. It’s easy to use and also looks just a little more stylish. On the back of each earbud is the Jaybird logo on what looks like cheap plastic caps. You may be noticing an overarching theme here: the X3s are way more polished than Jaybirds previous headphones when it comes to build and design. The one area that I wish they improved on was their sweat proofing, which is still stated as having a sweatproof hydrophobic nanocoating rather than an actual waterproof rating. It’s worth mentioning that I had no troubles during my testing and if you do experience issues, the Jaybird warranty covers you for a year. The hardshell carrying case also got a demotion, but I actually like the new one better. It still protects the headphones but now I can stuff it in my pocket if I need to. Unlike the last case which was basically a solid treasure chest of rubber. Again, it’s just more polished and practical. The X3s now have Bluetooth 4.1, which means that you can connect two of them to the same source device if you want to. You can also connect to two different devices at once, though weird things started to happen when I did. For example, when listening to music on my Pixel while connected to my iPad, Siri would pop up when I held down the multifunction button in the middle instead of the Google Assistant (2018 sidenote: Man, I miss my original Pixel phone). Of course, I’m not entirely sure how often this will come up in real-world usage but it was something that I figured I’d mention if you use both Android and iOS devices as I do. On another note, lag or latency on these is pretty much nonexistent. I caught up on all the Casey Neistat vlogs I’ve missed which is a very entertaining way to test Bluetooth headphones. The control module of the earbuds work great and let you skip between tracks and adjust volume as needed. What’s a little more practical is how strong the connection is to my source device and here I had very few issues. The connection stayed strong for up to around 20 – 25 feet, and there was only mild skipping when exercising. I counted three small stutters in about three hours of exercise which isn’t bad. Connecting was simple and I got both iOS and Android devices to connect within 10 seconds each. That equality between the two operating systems extended to the playback controls as well. You can raise or lower volume with the top and bottom buttons, but you can also skip between tracks by holding them down for a second or two longer. If you want to access Siri or the Google Assistant simply hold the middle button down. Tapping that same middle button will also pause/play music. Then there’s the app. In it, you can choose from a few presets and even customize the sound to your liking if you don’t like any of them. Once you make (or pick) a preset, it will be saved to the X3 headphones so you’ll get that same sound profile regardless of which source device you’re using. On top of that, it’ll tell you exactly how much battery is left which is always nifty. The Jaybird X3’s come with nice, memory foam ear tips. Jaybird claims a battery life of eight hours with the X3s, which matches that of the X2. It would’ve been nice to see them take a step forward in this department but I guess battery technology isn’t quite there yet considering how small it needs to be to fit in these. That said, we got a little under eight hours of playback on average to high volume which is still pretty good. We did all of our listening using the “Signature” sound profile in the app which is the default setting, and everyone knows how important defaults are. The Jaybird X3 earbuds are made of a sweatproof plastic, but lacks an official IPX rating. Lows were a little too big sounding for my taste during average usage, but it’s definitely helpful while running. Sometimes you need that extra push to keep you going. But if you don’t agree, you can always just change it via the app. Still, for the default sound profile, it wasn’t bad. I felt like the mids lost a bit of their clarity compared to the X2’s. Vocals were pulled back just a little bit and with the kicking bass it made for a pretty busy mid-range. This is especially noticeable in the song Mr. Rager by Kid Cudi. The snare during the chorus sounds like it digs into the vocals slightly with every hit. Highs are also given a slight push and it can lean a little towards harshness though it never quite becomes painful. The intro to Little Wing by Jimi Hendrix does come in a little strong and slightly uncomfortable as he strums the guitar. As I said, it’s not really painful but enough to make your ears perk up. How do they Jaybird X3 compare to the X4’s? The X3’s are a solid pair of ‘buds, but one of the biggest downsides was the lacking of an IPX rating. Having a sweatproof nano-coating is nice and all, but nothing brings peace of mind like passing a standardized set of water tests. Jaybird fixed that with the new Jaybird X4’s which now have both a sweatproof coating and an IPX7 rating. Besides that, there are only a few design elements that are different between the two. Mainly the fact that the X4’s look better put together. Jaybird ditched the fake metal caps on either earbud that looked like they were glued on and instead simply painted the logo, which is a definite upgrade in my book. Plus, both pairs have around the same battery life maxing out around eight hours of constant playback. As far as sound goes, the X4 earbuds maintain a very similar sound signature, with an emphasized low end to help push you through your workouts. You can EQ them via the Jaybird MySound app, but it isn’t going to drastically change the way the headphones sound. The bright side is that if you prefer a strong low end while working out, both of these pairs of headphones have you covered. While the Jaybird X3 are still a good pair of ‘buds, the lack of true water resistance is definitely a negative. 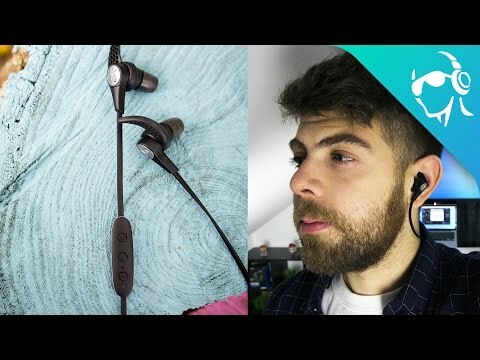 If you already have a pair of X3’s that are still going strong for you, there isn’t a need to spend more money to upgrade to the Jaybird X4’s. You might as well run your X3’s into the ground before upgrading. But if you’re debating between the two, we’d definitely recommend the X4’s because of that IPX7 certification unless you can find a pair of X3’s for way cheaper than $129.